North Miami Movers – Moving can be a big job, but it doesn’t have be a stressful one. Discount South Florida Movers is here to ease your worries. We have over 15 years of experience in the Dade county area and throughout Florida. Our rates are the lowest in town and we guarantee your satisfaction in the move Let us help you with all your moving needs. We offer an array of services and can accommodate any customer request. From neatly and securely packing your belongings to moving specialty items like pianos, we do it all. Whether it’s a short move down the street or a long move across the state, let us help you with all of your home or office moving needs. North Miami is the 6th largest city in Miami-Dade County. The city was originally incorporated as a town in 1926 but later incorporated as a city in 1953. The town was severely impacted by the 1926 hurricane with much of the economy destroyed. However, the postwar boom in the late 40s brought an influx of veterans enabling the town to reincorporate as a city. The city is home to two state parks. The first is the Arch Creek Park. The other is the largest urban park in the state. Located along Biscayne Bay, the 1000 acre Oleta River State Park was built adjacent to reclaimed land in 1986. Also residing in the city is their Museum of Contemporary Art and The Auto Museum. 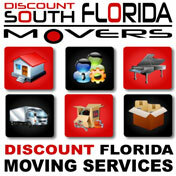 Discount South Florida and North Miami movers provide low rates on residential, commercial, piano and long distance moving.